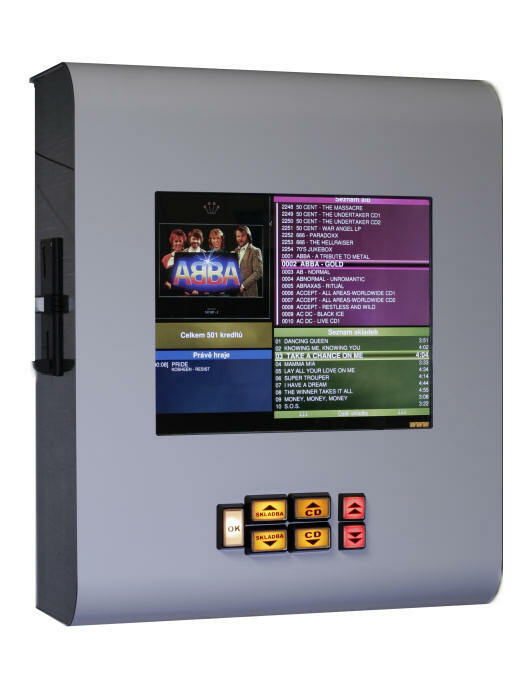 Thosli is a Czech leading company in manufacturing jukeboxes. We are also specialists in restoration of classic Jukeboxes. We restore used machines, such as the Rowe/Ami, see the picture below. We of course rebuild other brands, such as Wurlitzer, Rock-Ola, Seeburg, NSM, Sound Leisure and other types of jukeboxes. Our machines are multilingual. This means that you can set a public as well as admin menu in a certain language. Currently, it is possible to set English, German, Czech and Greek language. In the near future we are preparing to add Polish, Ukrainian, Russian, Spanish, French and Hungarian. The coin acceptor accepts coins up to 22 coin denominations. We usually install coin validators Cash Flow 330, NRI G13 and ict SCA1. 1 TB hard drive can hold far more than 80 000 songs, karaoke and video clips. Radio remote volume control is part of the jukebox. 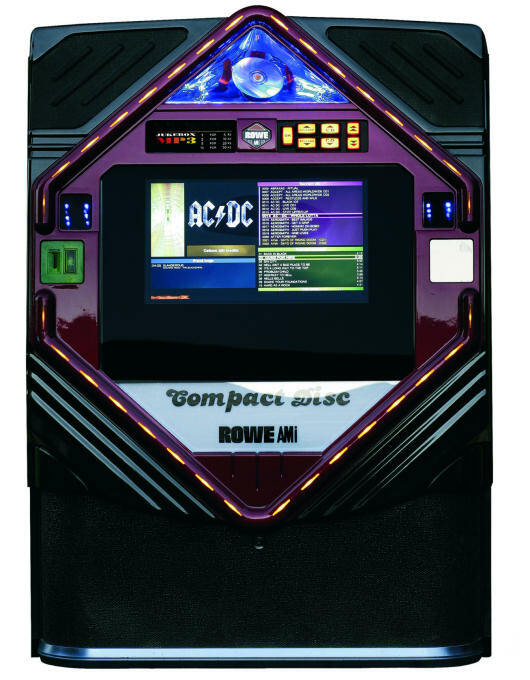 Clearly displayed menu at 17″ or 22″ LCD monitor according to the type of the jukebox. Overrun of tracks and overpaying. The jukebox automatically plays random songs in the AUTOPLAY mode. In the Free Play (Happy Hour), a time range in which the play is for free is set. The electronic coin acceptor can be programmed to any currency. One game is worth some coin. When inserting a quadruple, extra bonus track is obtained. When inserting a ten-fold value, there are 3 bonuses, so 13 songs. If the customer (player) wants to play longer than 7 minutes, they pay 2 credits. For a track longer than 15 minutes, they pay 3 credits and, for a track longer than 24 minutes, they pay 4 credits. The karaoke can be set to a higher monetary value containing e.g. two credits. You can set automatic attenuation of sound in night mode and increase it again after the end of the curfew. For example, from 10 p.m. to 6:00 a.m., the volume is set to half of the value. 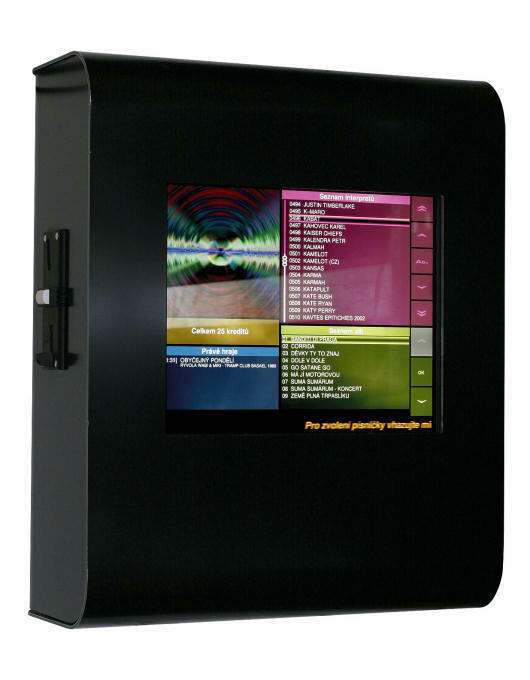 In the function “genres”, the monitor displays artists and songs from the selected musical genre, TOP 20, then hitparade of the top 20 most watched songs in the jukebox. The search function allows you to search from a list of all the music. You can view the number of all the songs in the jukebox. All settings can be changed in the administrator menu.